What connects Alexandra Palace, Excel and Olympia, other than the fact that they're all exhibition centres beginning with vowels? Those are the three locations where, right now, our votes for the Mayor of London and London Assembly are being counted. Here's the scene at Olympia. The London Elects web site has a live update of vote counts. 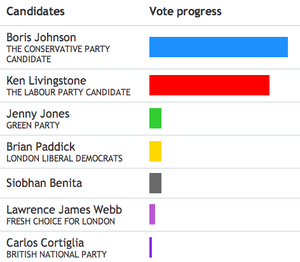 Tory Boris Johnson has a clear lead over main rival Ken Livingstone (Labour), with Jenny Jones (Green) in third. Lib Dem Brian Paddick and Independent Siobhan Benita appear to have a similar share of the vote. Results are not expected till 6pm at the earliest, with 8pm thought more likely. Although Boris is in the lead, the picture is not yet complete. Unless he charmed over 50% of us, the supplementary vote kicks in. This means all candidates are eliminated except for the top two (Boris and Ken, in overwhelming probability). The votes we cast in the second column of our ballot papers are then summed for the two remaining candidates and added to their first-round tallies. Whoever has the highest total takes City Hall. This page summarises the process, as well as the somewhat complex mechanism for working out who sits on the Assembly (a combo of first-past-the-post and a modified d’Hondt Formula, as we're sure you already know). The London Elects website suggests that Labour are trumping the other parties in the Assembly votes.